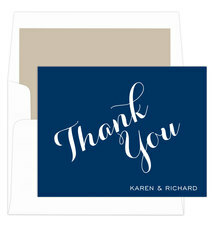 These modern foldover note cards are perfect for your thank you notes to friends and family. Printed in your choice of raised ink color and stock color. Size 5.5" x 4.25". Matching blank envelopes included. Printed return address and optional envelope linings available. Positioning only as shown. Wording "Thank You" will always appear as shown.